I had a really sweet Mother's Day. I have never seen two kids as excited about Mother's Day as Asher and Rose were. You would have thought it was Christmas the way they went on the night before saying, "Oh, Mom tomorrow is Mother's Day! Aren't you so excited. So so so so so excited!" It was contagious and I think it was definitely my most looked forward to Mother's Day. A very fuzzy picture of a very sweet moment. 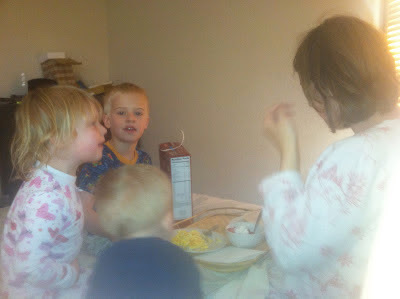 They also were excited to give me my present (wrapped in a cereal box). It was an electric toothbrush and they thought it was the coolest thing ever. I try not to think about it, but I am sure that they have all tested it out by now. The next best part of the day was hearing my kids sing in Sacrament meeting. Rose smiled at me the whole time and it was really cute. Then the next best part of the day was that later that evening when we were walking along the fence by our field we discovered several big patches of wild asparagus. I was so excited because I have always wanted to find wild asparagus. It just seems too good to be true that food, real food, could just be growing right under your nose and all you have to do is go pick it. It makes me feel all hunter-gathery-pioneer-woman-like. We picked a big bag full and ate if for dinner that night. It was so, so yummy. The best part is that it our neighbor said that if we pick it every few days we should probably get five or six more meals out of it before it gets too warm. Over all, it was a really great day. A blizzard for two days (really) dumping five inches of snow in MAY. But even crazier is that a week and a half later the temperature was 97 degrees! I almost couldn't believe it when I looked at the temperature. How wild to go from freezing to boiling in little over a week. Luckily I think the weather has leveled out and is going to stay around 70 or 80 for the next few weeks, but with Iowa I guess you never know. It has also surprised me how fast rain and thunderstorms can roll in. One moment it is nice and sunny and then wham... rain. And not just a little bit of rain. R-A-I-N. The other night Jon and I were laying bed watching the sky light up with lighting every few seconds. It was incredible. I have never seen rain like that before. It made me realize that I certainly don't live in a desert anymore! The best part of living here has been to watch my kids spend so much time playing and exploring outside. They are enthralled by everything and it so much fun to see them discover and learn. Asher has been really interested in all the creatures that roam around and has been trying to figure out ways to catch them. The other night he spent some time putting together a rabbit trap. He dangled a carrot and the end of a stick and had it all planned out that when the rabbit ate it the stick would fall and trap him. It didn't work, but it was sure fun to see him using his creativity to put it all together. Rose also found a toad last night and I don't know who was more excited about it, me or the kids. I had never caught a frog or a toad before and it was so neat. We decided that we will keep it for a few days so that we can watch it and learn about it, and then we will let it go in the ditch. So far we have had a lot of fun learning about toads (and the difference between toads and frogs) and catching bugs for it to eat. Rose has named it "Toady baby". I think later today we are going to draw pictures of it and write some of the facts we have learned about toads down in our nature journals. I have been planning on studying animals this next year with the kids for home school and so I guess this is our first "official" animal lesson! It also gave me hope that this home school thing is actually going to work when yesterday, as we were putting the frog in its new home, Asher gave me an earful about how the toads skin is bumpy and brown because it needs to be camouflaged to blend in with its environment. I didn't even know he knew about that. It just reminded me that curious kids really learn so much more than we "teach" them! So thanks for letting me vent out my frustration and fears yesterday. I think writing is good therapy for me. After writing my post yesterday I felt so much better. I am blaming my breakdown on pregnancy hormones. It seems like my ability to cope with things lately has been about a third of what it normally is. We really are doing just fine (in case I made anyone overly worried) and I know that all the things I am stressed about will find a way to fix themselves. For example, remember how I was stressed because our lawn mower broke? Well, last night Jon went and picked this up for dirt cheap. I guess the man who was selling at been trying to get rid of it for a long time and couldn't figure out why no one was buying it because it was so cheap. Jon said that maybe it was just waiting for us. Granted it doesn't run, but hopefully that will be remedied soon. It was just a reminder to me that God really does provide, and that he is fully aware of what we need... often times even before we are. I just love it that Rose is reading her book in this picture! Any suggestions for surviving varicose veins during pregnancy? I had a few varicose veins with Rose but nothing big. With Abe I started to get them pretty bad, but then they went away half way through my pregnancy. Usually varicose veins just get worse the further along you get and so the only explanation I have for why they got better is that I was seeing the chiropractor almost once a week because my hips were so bad. This time around though my hips feel great (yippee!) but I have varicose veins much worse... and I don't think they are going to go away this time. Luckily though I only have them on my right leg, which is strange but I am not complaining! I bought two pairs of sturdy support support nylons, one that is designed for pregnant bellies and one that is footless so I can wear sandals. So far they have been helping, but it is starting to get pretty hot and I don't know how I am going to stand to wear them all summer. My only other coping technique has been to take hot baths with Epsom salts in it. But even hot baths aren't going to be appealing for much longer. I know varicose veins are fairly common during pregnancy and so I would love to hear how other women (especially those who were pregnant in the summer) have coped with them. I am sure they will go away after I have the baby, but until then I would love any tips for making them not so annoying. Oh, and I had Asher take a picture of me this morning (which is why it is crooked) so that I could show my family my baby belly. 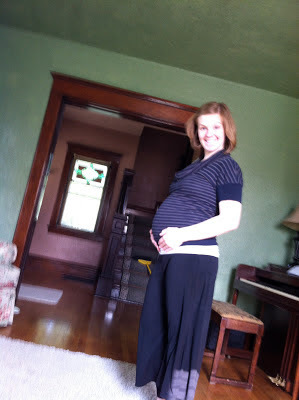 I went to the midwife this week and I am about 23 weeks along, though I am measuring at about 24 weeks. I feel really huge already, but maybe that is just because I have forgotten how much bigger I am going to get! A blurry kid-taken picture, sorry, it is the best I could get! Overall, I am feeling really good and I am getting excited for this baby. Abe has started giving my belly kisses and pats. So I think maybe this baby is starting to become much more "real" for all of us! Unfortunately the only thing that helped my varicose veins were very sturdy (30 mmhg minimum) compression hose. I had to wear thigh-high hose because my v.v. extended well beyond my knees, but if yours are only on your calves, you could probably get away with knee-high. Buy the Jobst Ultra-Sheer (or equivalent, if your insurance covers them) or a generic equivalent through Ames-Walker. They're much thinner than the ones you typically find in drugstores. I've always worn mine starting in the fall and ending late spring, so I totally feel bad that you have to wear them in the summer. They're hot and uncomfortable, but they also feel great when you're wearing them. I'm a fairly new follower of your blog and just moved with my family from New Mexico to Nebraska, so I can completely relate to your remarks about the bipolar weather and all of the fun outdoorsy experiences to have with kids. Its fun to read about someone else going through the same adjustments, thanks for sharing! Sorry, one more thing. As I recall, we are about the same height (I'm 5'4"). I also recommend getting the short version of the hose, as the normal sizes were too long on me. You look adorable. Wish I could come visit you on your new farm and eat some asparagus! Yum.